the magnitude of alongshelf wind stress, which decreases by a factor of eight over this region (Hickey and Banas, 2008). Figure 1: Map showing the location of the NEMO moorings(star) and gliderline (blackline), as well as the NDBC Cape Elizabeth meteorological buoy 46021. 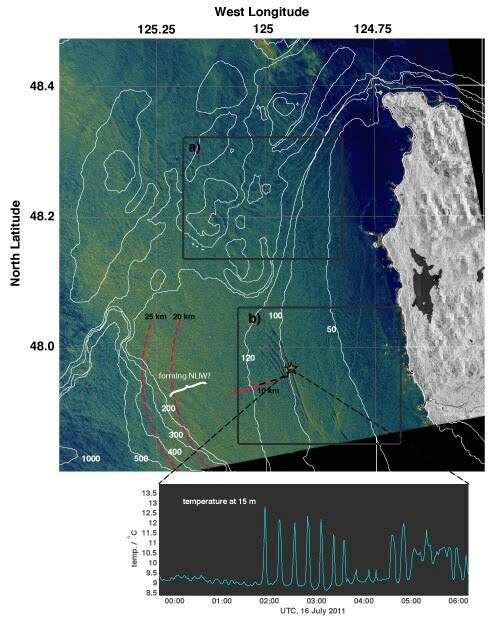 Observed barotropic tidal ﬂow and time-mean vector of the California Current are shown with a black ellipse and arrow, respectively, with scaleas indicated. 100m until 500m, then each 200m thereafter. Previous studies suggested that the northern CCS has several mechanisms that can produce upwelled nutrient concentrations comparable to those in regions with much greater wind stress. 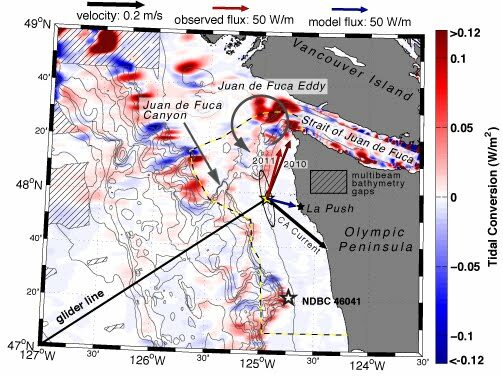 Top candidates include a persistent nutrient supply through the dynamics of the Strait of Juan de Fuca (Crawford and Dewey, 1988), freshwater input from the Columbia river plume (MacCready et al., 2009), the presence of the Juan de Fuca eddy, and enhanced upwelling by the Juan de Fuca canyon (MacFadyen and Hickey, 2010). In ways that are not yet fully understood, the unique aspects of the Washington continental shelf may conspire to boost its productivity (Hickey and Banas, 2008). as a fraction of the water depth. I propose to study the characteristics of internal waves on the WA continental shelf, the generation mechanism and dissipation of NLIWs and their potential influence on the nutrient supply in this region. We're interested in the oceanography off our coast. As part of the NANOOS program, we now maintain the Cha-Ba surface buoy, its subsurface analogue, and a glider line. We collectively refer to these systems as NEMO. Figure 2: Schematic of the NEMO (Northwest Enhanced Moored Observatory) system, with Seaglider, NEMO-subsurface, and the surface mooring Cha' Ba. Figure 3: Large, ubiquitous nonlinear internal waves (NLIW) have been observed at the NEMO mooring location---associated with rapid vertical movement of density surfaces and strong velocities and velocity shear. These waves may be an important key to the increased productivity on the Washington coast, with prior research showing that they may be important to supplying nutrients to the shelf. Figure 4: Top: Synthetic Aperture Radar (SAR) satellite image showing sea-surface roughness patterns off the Washington Coast offshore of Olympic National Park (Lake Ozette and Point of Arches). The image shows two regions ("a" and "b" in black boxes) of nonlinear internal waves (NLIW), as indicated by coherent bands of rough and smooth water associated with wave troughs (convergence) and crests (divergence) respectively. White bathymetry contours suggest topographic steering of the waves in box "b" similar to the refraction of surface waves as they approach the beach. Bottom: A time series of temperature at a depth of 15 m on the NEMO surface mooring (Cha' Ba), verifying that this is a propagating NLIW. General circulation models (e.g. Samelson, 1998) indicate that the thermohaline circulation is highly sensitive to the global magnitude and distribution of mixing. Recent observations (e.g. Polzin et al 1997) highlight the inhomogeneity of mixing. Therefore, a global map of mixing would benefit climate modeling, as well as our understanding of biological productivity and pollutant dispersal. Since global measurements of mixing are impractical, another way of estimating the global mixing distribution is to map the energy flux into internal waves, and then to measure their subsequent long-range propagation. Figure 1: (top) Depth-integrated, annual-mean near-inertial energy-flux vectors are plotted from 60 historical moored records. The length of each arrow is logarithmic, with references indicated at upper left. Moorings with |F|< 0.1 kW/m appear as a black dot without an arrow; white dots indicate moorings which were unusable. The few instances of poleward propagation are plotted in white. Color map indicates annual-mean energy-flux from the wind to near-inertial mixed-layer motions from Alford (2001). The color scale is logarithmic and is indicated at upper left. The box in the NW Pacific is discussed in the text. (bottom) Arrows are as in (a) but for the M2-tidal band. Color map denotes internal-tide conversion using the TPXO5 model (Egbert and Ray, 2000), courtesy of G. D. Egbert. The lines in the western Pacific and near Hawaii are discussed in the text. The inset in each panel shows a histogram of the poleward component of the flux for all moorings. The first step is to map the distribution of the two primary internal-wave sources, the wind, which generates near-inertial waves, and surface-tidal flow over topography (Egbert and Ray, 2000), leading to internal tides. The wind-flux portion is calculated (Alford, 2001) by using the NCEP/NCAR reanalysis wind fields, which incorporate observations over many years and locations into a dynamically consistent framework, to drive a simple model of the mixed-layer response. The energy flux is then given by the scalar product of the wind stress and the mixed-layer current. Ongoing work involves examining the high-latitude dependence of the fluxes (as the response gets faster at high latitude, the NCEP winds become more and more inadequate for the job), and the interannual variability of the fluxes. 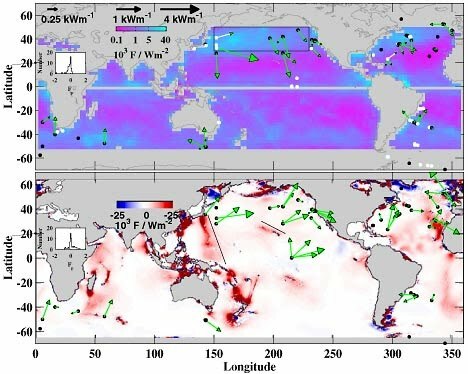 The global distribution of the energy flux available for internal waves is plotted below for the wind (top) and the tides (bottom, courtesy of G. Egbert). The greatest wind inputs occur at midlatitudes during wintertime, associated with travelling storms. Large tidal inputs (red regions) occur where the surface tide flows perpendicular to rough bottom features. The subsequent horizontal flux for each can be measured using historical moored records by solving for the lowest two modes and computing <u'p'>, where u' is the baroclinic velocity and p' is the baroclinic pressure anomaly. Near-inertial fluxes are large following wintertime storms, and are equatorward, since waves generated at the inertial frequency become evanescent poleward of their generation site. The tidal fluxes are usually directed away from strong topography. Since then, Zhongxiang Zhao and I have been working on further refining our estimates of the global distribution of internal-tide energy flux from both moorings and altimetry, which has resulted in a series of papers and an exciting new NSF proposal. Harper Simmons and I are working together to compare models and observations in order to determine the analogous fate of the near-inertial motions.